On Saturday, with very kind hospitality from Andrew and Katherine Impey, some of our UTXers met for a day led by Beth and Liv from The Stewards Trust The Stewards Trust website. The day started by chatting and getting to know each other with icebreaker questions before going outside for some fresh air and games. After some midmorning refreshments everyone sat down for an informative session discussing the difference between false and true confidence and reading what the Bible teaches us about confidence. The morning ended with some quiet time to spend alone with God and ask Him to ‘reclothe’ us with true confidence; all to the backdrop of Liv’s wonderful guitar playing. 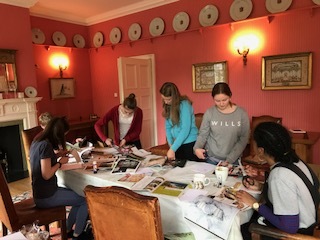 After a short break for lunch together the scissors and glue came out for a craft activity, where the group made framed collages of words and images from magazines that related to true confidence. Later on they shared and discussed their work. Who knew that so much wisdom could be found in Glamour magazine?! Following this, there was a short Bible study and discussion on who we may all achieve true, unconditional confidence. Then, after hearing some tips on how God may speak to us, the day ended with an opportunity to listen to Him and pray for each other. It was a wonderful end to an uplifting and insightful day. The day ended with an opportunity to listen to God and pray for each other. A wonderful end to an uplifting day. Quotes from our amazing young people included: ‘cool’ and ‘awesome’ ‘absolutely loved it’ ‘came home buzzing’ ‘Liv and Beth are so lovely’ and ‘I feel more connected to Jesus’. For more information about the Stewards Trust Beth and Liv can be contacted on beth@stewardstrust.org.uk olivia@stewardstrust.org.uk. Alex our Rector writes: ‘Thank you so much to The Stewards Trust for visiting us in rural Hampshire, we hope that we can do this again next year and do other work with the Stewards Trust going forward. Thank you also very much to Mike and Kelly for organising things our end and to Andrew and Katherine and Olivia for your wonderful hospitality.